Take steps to reduce stress in winter and spring barley crops to improve resilience to Ramularia infection, urges Alistair Gordon, regional technical manager in Scotland for leading agronomy firm ProCam. Although physiological stress that produces superficial brown spots on upper leaf surfaces of barley can cause some yield loss, he says the bigger issue is it can trigger Ramularia flare ups in infected plants. And with no AHDB variety resistance ratings available for Ramularia, knowing how to reduce stress could become particularly relevant when chlorothalonil is no longer available in future, he believes. “Ramularia appears with a vengeance in crops under stress,” explains Mr Gordon. “You can’t do anything about weather-related stress factors, such as bright, hot days and cold nights that exacerbate the problem. But you can ease stress from other sources. “As well as factors such as correcting soil pH to reduce stress, and avoiding large tank mixtures with excessive amounts of adjuvants, make sure barley isn’t held back through limited availability of manganese, copper or zinc. These are key trace elements for cereals. With many farmers opting to plant stubble turnips or kale last autumn after the fodder shortage of the dry summer, Mr Gordon says sheep grazing on these will have naturally boosted soil fertility through manure. 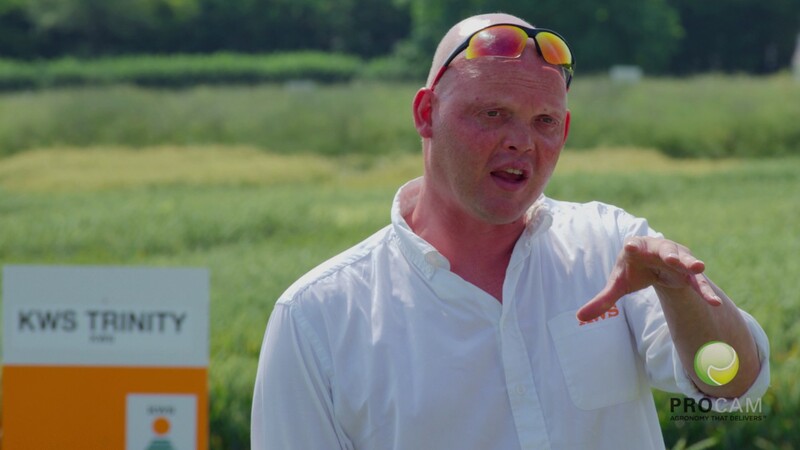 However, ProCam has also been evaluating micronutrient and biostimulant treatments in spring barley, he says, and found significant improvements in both root and shoot growth. “We have tested a number of these treatments and seen clearly which ones give the best improvements,” Mr Gordon explains. “To help the crop I would look to apply one of these treatments at stem extension. At this timing, there should be enough leaf on the plant for effective spray absorption but without requiring an extra spray pass, because the treatment can be co-applied with a herbicide. “If growing a crop of winter barley that develops Ramularia, remember that this can provide a source of infection for neighbouring spring barley fields. Any future development of variety resistance ratings for Ramularia could rapidly become useful when choosing feed barley varieties, says Mr Gordon. But uptake of malting barley resistance ratings could be slower, as malting variety choice is largely driven by end market requirements, he adds.